I kept having to ask myself, "Why am I doing this? Why do I care? I like the song. I saw it covered in a cool way by Bon Jovi. I enjoyed the experience. Isn't that enough?" Well, yes -- and no. Consider this statement:"We must learn again that vision is not for private consumption. My vision is my vocation; the world is waiting for it to find concrete form. So few people, alas, still perceive the art in which they participate -- music, films -- as an arena for exchange of visions, for discovery of our common human vocations...Many of our contemporaries think of art...simply as relaxation or personal therapy. They use their imaginations to flee into their mental cocoon, to weave a personal lifestyle not open to discussion." 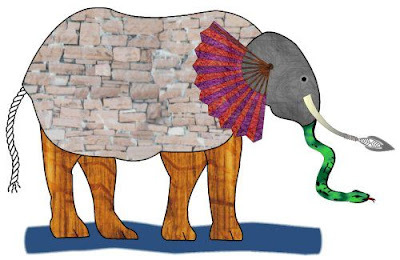 So, hurray for the six blind men of Indostan for at least talking about the elephantin the room! Sadly, it doesn't seem that they got very far in listening to each other, "Of course, an elephant is a wall, or a rope or a snake. This is what my personal experience dictates as truth!" But you got to start somewhere. In the spirit of learning from the six blind men, and because this conversation about a song and a song-writer seemed to become more than a simple discussion about songs and television shows and 8o's rockers. And, because it seemed, to me, to grow into a deeper discussion about some pretty important subjects -- art and faith; sacred and secular; art-making and art-responding and all that. 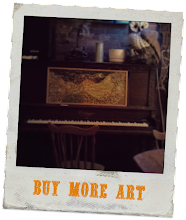 And, because we have this wonderful vehicle of discussion, our blogging community, why not further the conversation right here, right now? And, why not? What follows is my very ameteur attempt at breaking down the discussion-- generated here and elsewhere -- regarding this piece of a art, a song Hallelujah, written by an artist, Leonard Cohen. Please be patient with me, gentle readers, as one blind man to another. 1. Is it possible to engage in worship with a song (in this case) that was not ever intended to be a vehicle for worship? Part b: Is it possible for a person to engage in the act of worship without the intention of worship? 2. 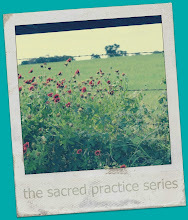 Is it possible to mix the sacred and the secular, the pure and the profane, without one diminishing the other? 3. Lastly, what the heck did Leonard Cohen mean when he wrote this song, anyway? Alright, I'm going to go hang out with the elephant a little bit longer. In the meantime, feel free to give your input. From the discussion here and here, do you think these three stated questions are a fair summary? where, oh where, did my sidebar go and how do i get it back? does anyone know? so for the last couple of days I've been fighting a wicked sinus cold. a year or so ago a friend of mine turned me onto the granddaddy of all sinus medicines -- Mucinex. you've seen the ingenious commercial right? the medicine does battle with the bulbous and grungy little green men trying to take up residence in your head. the medicine flushes those green guys right out. so last night, in my sleep, while the medicine was doing its dirty deed, I dreamt of several people who I have felt betrayed by over the last year or so. tell me, where is the magic medicine for that?? my family had a very busy weekend last Saturday and Sunday. 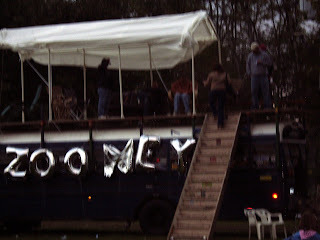 first on saturday, we attended our first ever Zooneyfest at Country Pines on Route 26 in Endicott. it was very, very, very cold outside. lots of people there didn't seem to notice because they were drinking lots and lots and lots of beer. we had to put on lots and lots of coats and blankets because we only got to drink a little bit of beer. if we wanted to use LOTR as an analogy (and why not, i ask? 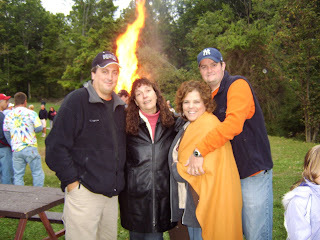 ), this evening was the party in the shire -- with a humoungous bonfire instead of Gandalf's fireworks. 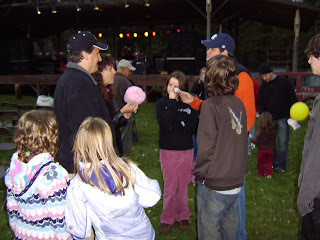 this party had lots of cotton candy, greasy meat, beer and live music. 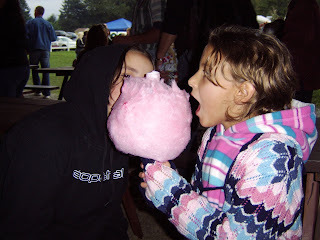 my kids -- intoxicated with airy pink puffs of sugar -- thought this was the perfect way to spend a saturday night. 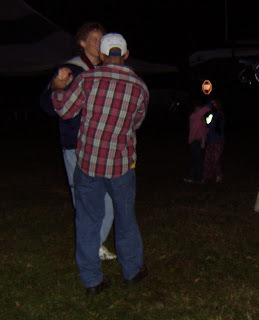 our friends, Chris and Lori, love to dance. they are very good -- they even know how to polka! we felt old and boring when we looked up during the first song of Frostbit Blue's set and saw Chris and Lori swinging! Chris is the reason we went to Zooneyfest in the first place. he is friends with Joe Zunic -- the guy the festival was created for. he has Lou Gehrig's disease (some people call it ALS). he is barely over the age of 30. chris reads the bible with him -- and sometimes goes to mass with him because that's where Joe Zunic will go. i think Chris is acting like Jesus. i want to learn how to do that, too. the other reason we went to Zooneyfest was our friend Scott. Scott plays the guitar. Scott plays the guitar really, really, really well. this is Scott as a guest guitar guy during Frostbit Blue's set. the lead guitar guy and vocal guy for this band is Scott's brother Nick. they pretty much rocked our heads off during this song. Scott used to play in a band with his brother -- they played at lots of bars and stuff. i think they were probably great. Scott decided not to do this anymore after he met Jesus. Nick does not know Jesus. his band is pretty famous where we live. sometimes Scott goes to the bars and stuff to watch his brother...like at the Zooneyfest. i think Scott is acting like Jesus. i want to learn how to do that, too. 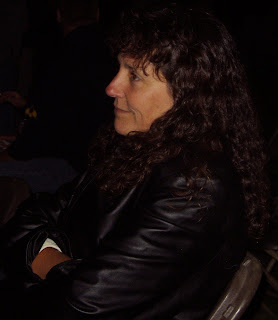 this is Coleen, Scott's wife. i love this picture of her face. she is watching Scott's guitar solo. i can tell that she loves him very much. Coleen introduced Scott to Jesus after they were married. Jesus helped them decide to stay married. they have a great story. i never get tired of hearing it. this is the bus my kids kept wanting to play on. by the time we left it was full with drunk people. after we left there was other stuff going on in this bus. we decided we left at a pretty good time. if we kept using LOTR as an analogy (and why not, i ask? ), Sunday would have been like the feasts at Rivendell, that ancient and lovely place where the fancy elves live. on Sunday we went to this church in the middle of nowhere. (there were cows in the front yard!) 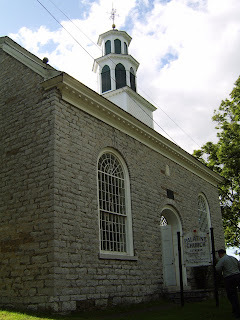 the church was built in 1770. inside there was a thirteen-star American flag hanging over the narrow wooden pews. the pews were very hard to sit in. especially for my friend, Neil. he is 6-feet and 8-inches tall. 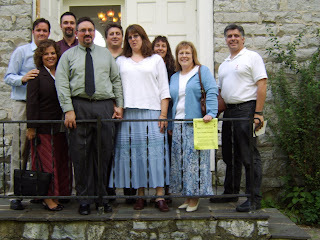 the Shrine of Lutheranism in the Mohawk Valley"
my friend Sean is the reason we visited the old church building. Sean plays the organ really, really, really well. he is even in a Guild. i do not know what that means, but i know that one thing it means is that Sean has to wear special shoes when he plays the organ. and he gets to give recitals like this one. 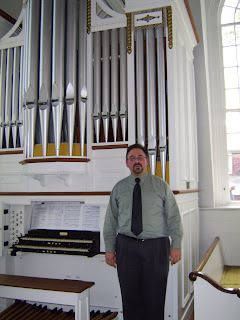 i think Sean is like Jesus because we do not have a fancy organ at our church. we don't play old, old songs written by the composers that Sean loves. but Sean plays for our worship team anyway. Sean does not complain that he can't wear his special shoes at our church. i want to learn how to be like Sean that way. this is Laurel. she is Sean's wife. i could tell she was very proud of him this day. she is a very smart woman and she draws beautiful pen and ink pictures with hundreds of tiny, tiny details. she entered some of them in our art show this year. she also knows how to plant stuff in beautiful patterns and keep flowers alive. i'd like to learn how to be like Laurel that way. another thing i like about Sean and Laurel is the way they love their kids. they are very good parents. 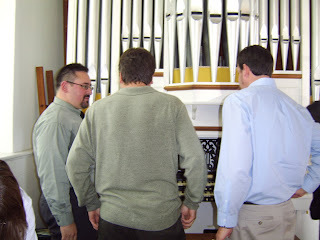 the brochure said that this organ "has direct electric action and an American Guild of Organists standard console. It contains 648 speaking pipes and two manuals." i do not know what this means, but i think it is why Sean looks like he is playing Twister instead of playing the organ. i think it is also why sometimes Sean looked like he was shooting stars out of his fingers and toes instead of playing an instrument. and why a few times i felt like one of the low loud notes was not a note but a spear pinning me right through the middle of my chest and to the back of the very hard pew. 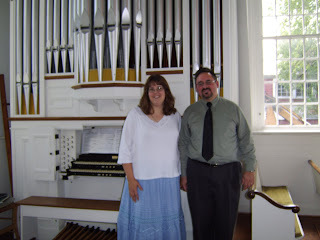 these are the friends who rode together to see Sean play the organ -- Brian, Tami, Neil, Scott, Coleen, Margaret and Paul. Margaret made us cry during church that morning when she sang "The Lord's Prayer". her voice made my skin get all bumpy. we were very glad we decided to spend the day together driving through farmland to find this old church. we laughed a lot. sometimes we laughed too much and had to find a gas station with a bathroom. my friends make me think about Jesus. i want to learn how to do that more. This discussion of Leonard Cohen's song Hallelujah has caused me to think through so many valuable questions and beliefs this week. For some time now I have been living two lives: mom-of-four, wife-of-Brian, occasional house-cleaner and part-time church employee by day and insatiable-scholar-of-everything-arts-and-faith-and-church by night. For some reason I've been embarrassed to let people know how much time and energy I've invested in this moonlighting gig. I'm discovering, almost daily now, many of the fleshly fears as well as enemy-influenced deceptions that have contributed to that embarrasment (read shame). Sometime soon I'll post the story from a childhood event that seems to have been the birthing room for much of that fear and shame as it relates to my desires to be an artist -- an art-lover, art-maker and art-supporter. Just look for the title that includes the key phrases Music Machine, Grandma's Livingroom and Cranky Cousins. Along with that post, I'll include the journal entry I wrote after a phone conversation I had with David Taylor, arts and teaching pastor at Hope Chapel in Austin, TX. (what a gift of kindness that phone call!). It has been some time since I've felt like I've "heard from God" on His purposes, calling, on my life. (many reasons contribute to that, but that's another story for another day) In the past few weeks, though, I've begun to wonder if God is calling me from a place of reaction to my youth and, instead, calling me toward a pro-action for my adulthood. I feel like God is asking me to go up to the next level spiritually, emotionally, physically and intellectually. To move closer to becoming like Christ, and in turn become more like myself. The person I will be - forever. 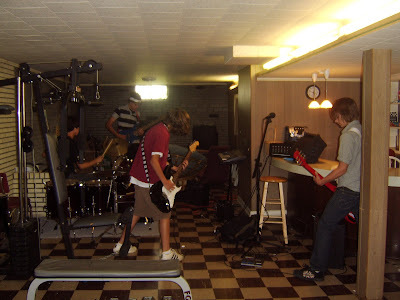 And all of these seems more poignant against the soundtrack of my sons' band, Dot Rama, rehearsing in the basement. They have their own insomnia-inducing dreams. I do not become more like Christ and more like myself for only myself. What I do and believe and live affects people around me -- especially those five other people who live with me day in and day out. Ok....question.....and I might be crazy. I watched Bon Jovi do the song on youtube and then looked up the lyrics to Leonard Cohens version and it doesn't seem like a worship song at all. Am I nuts here? lol. It even has the line in it "Maybe there's a God above". I'm very confused. thanks for investigating that...i was watching so late at night and the volume so low i couldn't hear all the lyrics. however, there's something about the chorus of that song...the 'hallelujah' that seems to move people beyond themselves. of course, this is no measure of one's understanding of Truth in Jesus Christ, but it does seem to demonstrate longing for that Truth. OR -- I could be completely out to lunch! thanks for your feedback. 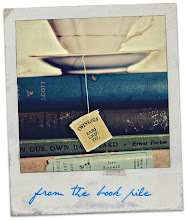 checking into this a little bit more 'cuz i don't want to asserting stuff on my blog willy-nilly like. the dictionary definition of 'hallelujah'.hal·le·lu·jah 1. Praise ye the Lord! –noun 2. an exclamation of “hallelujah!” 3. a shout of joy, praise, or gratitude. 4. a musical composition wholly or principally based upon the word “hallelujah.” maybe when a musician enters into this song he is an example of "even the rocks cry out" -- as he dives into his created giftings and delivers the message that literally means "Praise ye the Lord", then he is, in fact, engaged in worship. i'm not a theologian by any means, but it's interesting to think about. i'll have to check out the rest of the song lyrics. why do you think cohen wrote "hallelujah"?? I would love to hear from some of you others out there. What do you think?? Why do you think this song is so powerful and has been covered by so many artists and showed up on so many soundtracks? What do you think about the lyrics (in all of the various forms)? I just read here that Madeleine L'Engle passed away this week. Somehow, strangely, I feel like I've lost a friend. If you've never read A Wrinkle In Time or Meet the Austins or The Twenty-Four Days Before Christmas or A Ring of Endless Light or Walking on Water, please consider doing so soon. Luciano Pavarotti also passed away. Read here. i've been noticing Jon Bon Jovi showing up in very interesting places lately. 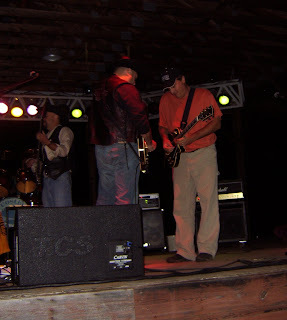 A while back i caught him on Crossroads with Sugarland. Tonight I found him on MHD Unplugged. He sang with All-American Rejects (It's My Life) and Lee Ann Rimes, but the moment that caught my attention most was his version of the Leonard Cohen song "Hallelujah". I am not kidding you when I say that he was worshipping...it came up from his toes. Can't guess what the rest of his life looks like, but in that moment he seemed to be fully aware who his Creator was.
" 'I guess I'm just feeling Septemberish,' sighed Chester. 'It's getting towards Autumn now. And it's so pretty up in Connecticut. All the trees change color. The days get very clear - with a little smoke on the horizon from burning leaves. Pumpkins begin to come out.' "
Out of the 365 annual possibilities I have to be astonished that God gave me four children, perhaps the singular most shocking day of the year is The First Day of School. I've discovered that it is not while I am in the middle of the swarm that is my family that I remember to be amazed. But when, each September, they sever the ties of summer and walk away from me -- into the authority of other adult people, into buildings I know nothing about, surrounded by people I've never met -- that solitary moment is when I most feel like a mother.